The company, founded in Ireland, AVA Trade EU Ltd. Called AvaFX until 2013 it was awarded several awards during its business activities. The broker regulated by the Irish central bank is now used by more than 200,000 traders from 160 countries. They deal with a total volume of approximately 60 billion US dollars monthly over the in-house trading platforms. The AVA Trade broker is obliged to comply with the MiFID Directive, which provides a framework for financial investment services in accordance to European law. The resulting transparency means more security for each dealer in connection with practiced user protection. AVA Trade also secures all customer deposits on separate trustee management accounts at Danske Bank in the Irish capital Dublin, which also speaks for the reliability of the provider. The following article outlines the most important criteria when testing AVA Trade and explains why a registration is recommended. The first deposit of new users is paid by AVA Trade with a bonus of 50 percent, this applies up to a deposit of 3,000 euros. In the case of more extensive deposits, the bonus drops to 20 percent in several stages, so that trade accounts of â‚¬ 50,000 are still subsidized with â‚¬ 10,000. Bonus payments are bound by the broker to the usual minimum trading volume and require proof of identity and place of residence. AVA Trade allows trading with more than 60 currency pairs, more than 100 CDFs on underlying assets, and the trading of equities and indices through Exchange Traded Funds (ETF). Beginners will decide to implement the commercial offerings for the very clearly conceived and internally developed standard software AVA Trader. It offers simple menu navigation as well as optimized risk management thanks to lesser leverage. AVA Trade offers advanced trading via Meta Traders in the latest version. Additional features allow the use of proprietary trading systems via API trades as well as algorithmic trading. The broker leaves the traders either to load a suitable software or to use a browser version for which no download is required. Independently of this, AVA Trade offers a mobile version for iPhones, Smartphones, and Tablets. The only requirement is an Android operating system. The mobile action takes place via the AVA Trader as well as the current Meta Trader and requires the download of appropriate trading apps. 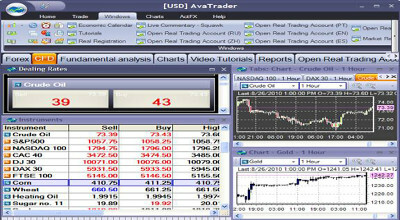 If you do not want to be permanently on the computer, AVA Trade can opt for automatic action via the Mirror Trader or via Zulu Trade. The first option allows automatic action with the imitation of successful trades of professional traders. Zulu Trade is a further platform of the provider, which allows the automatic trading of stocks, foreign exchange, indices and commodities by means of an individual trade strategy by API. 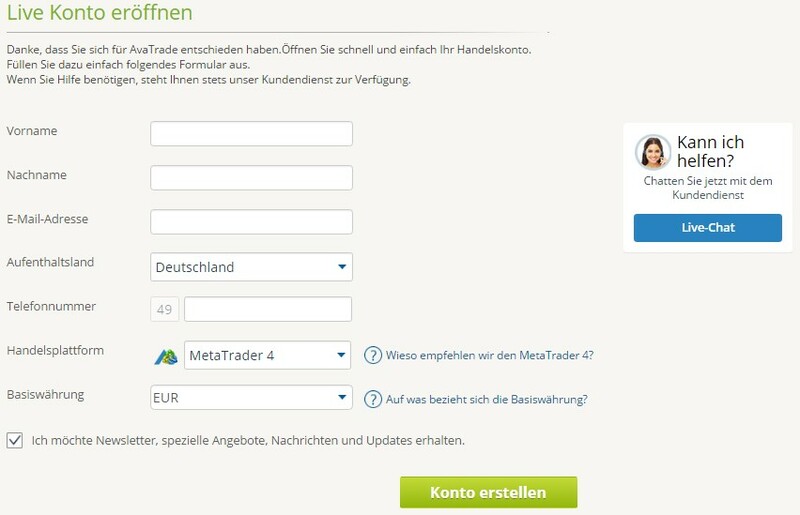 AVA Trade offers new customers a free demo account (fictitious credit: 100,000 euros) for three weeks. With this, the trader can try out different strategies in different asset classes. This creates security and prevents unnecessary losses during the initial phase. Those who spend the time with the demo account intensively can then make attractive returns in the live account via maximum leverage with small bets. The winnings are largely retained by traders in this brokerage, as AVA Trade waives the fees for payment. However, charges may be levied in individual cases by the credit card company or the bank. At this point, that trading in foreign exchange and securities is always subject to certain risks maximum leverage should only be used by experienced traders and in conjunction with suitable safety devices. The broker provides the required knowledge through free video courses and webinars. Anyone who has used the demo account for practice over the said period feels quickly fit to use real money. Already with a deposit of 100 euros, which can also be paid in dollars or pounds, everyone at AVA Trade can make profits. However, the low effort does not entitle the recipient to receive the above bonuses. Bonus claims arise only with a deposit sum of 250 euros and above. AVA Trade’s easy-to-use account or real money account is easily created in four simple steps. First, you must complete the registration form. In the second step, the new customer must decide whether to open a trading account or a demo account. The third step, as a result of the strict regulation, provides for the confirmation of the information provided by means of a copy file and an invoice which may not be older than three months. Finally, the first deposit is made by bank transfer or via the credit card and then decided whether a software or the browser version is used. AVA Trade accepts payments by a credit card or a bank transfer. In addition, payments can be made in real time via the three digital payment systems PayPal, Skrill, and Neteller. A payout is basically made via the payment option chosen and is usually processed on the same working day. As a positive aspect, we have to mention the excellent accessibility of AVA Trade, which is ensured in the usual Forex trading hours at any time of the day or night. Dealers from the German-speaking area can choose the Live chat or a call with the support via the free hotline. Of course, letters, faxes or e-mail are possible options for contact. In addition, the trader should consider the comprehensive information available on the website as well as the wide range of training materials as a plus. Video training, webinars and a free e-book for the foreign exchange trade ensure that beginners become professionals in no time. The excellent customer service led to the award of the Daily Forex Award, while the best signal system was awarded at the Dubai Money Summit. AVA Trade offers a wide range of account types and commercial products for beginners and professionals alike. Particularly noticeable are the extensive training offers for new customers, the retention of fees, the automatic option offered by the Meta-Trader. Attractive bonuses also make an entry appealing and the customer service available at any time strengthens the trust in the provider.